She graduated from Visual Art Studies at the Faculty of Philosophy at Comenius University in Bratislava. Her focus is on contemporary design and applied arts. 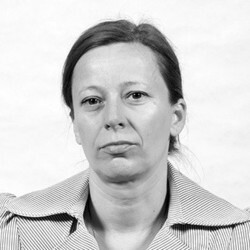 She worked for Slovak Design Centrum, during the years 2000-2010 she was the curator for Design Studio at Centre For Folk Art Production, then she worked as the curator of Art Design Project Gallery in the years 2011-2012. She organises an international festival of contemporary design Bratislava Design Week with Ľ. Hustá since 2012. Selection from her curatorial realisations: International symposium of artistic jewellery Kremnica 2003 - 2005, International Art Symposium Mlyny 2004 - 2012, Design in Slovakia 1990 - 2005, Bratislava 2005, New Traditions - Contemporary Slovak Applied Arts and Design, Wien 2004, Peknô.sk - Slovak Craft and Design (travelling exhibition through Finnish cities) 2006 - 2007, Circles: Ten Years of Design and Craft Competition circles on the water, Bratislava, Košice 2009, Levels - Contemporary Slovak Glass, Lednické Rovne 2014. Since 2013 she has been working as the curator of the Collections of of Architecture, Applied Arts and Design at the Slovak National Gallery. Her work is published in magazines Designum, Flash Art, R_U_D, Atrium, and Vlna.